Beginning the first week in April, work in the median of West Dodge Road will periodically block the eastbound and westbound lanes adjacent to the median for about four weeks (depending on weather). After this, all three eastbound lanes of West Dodge Road will be shifted north to allow construction site access. The number of lanes will not be reduced, and will last until April of 2021. The median will be removed; temporary barricades will be placed along the north edge of the space formerly occupied by the median to separate east- and westbound traffic. Eastbound lanes will shift to the north. One lane will be created where the median used to be, and the current curb lane will close for construction. Temporary barricades will be placed along the south edge of the shifted eastbound lanes. Westbound lanes will not be shifted. Left turns will not be allowed from eastbound Dodge Street onto North 80th Street during this configuration. The speed limit in the area will be reduced from 45 mph to 35 mph. Additional signage will be placed on West Dodge Road by the State of Nebraska and City of Omaha to help drivers navigate the construction area. Click here to view a map of the planned traffic changes. 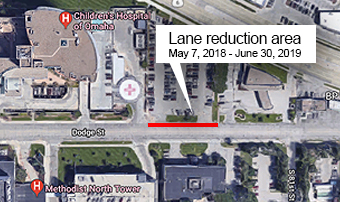 Starting in May, there will also be an additional narrowing of lanes on Dodge Street, the road which runs between Methodist Hospital and Children's Hospital, which will run for a shorter period of time. During that time, lanes just west of the American National Bank will shift for construction traffic, but there will continue to have two-way road access. Traffic in front of Methodist Hospital will not be impacted. Watch for further announcements on these traffic pattern changes in the weeks ahead. 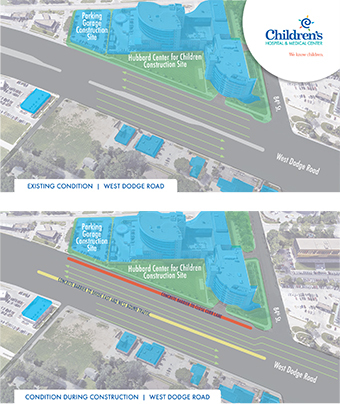 During the construction period at Children’s there are no plans to block traffic to Methodist Hospital or Methodist Corporate Offices. We will share additional announcements regarding traffic patterns related to the construction project at Children’s should they arise. Thank you so much for your patience during this project.